Biggest cow in the world: Knickers looms above the thousands of other cattle that he feeds with in rural Western Australia. 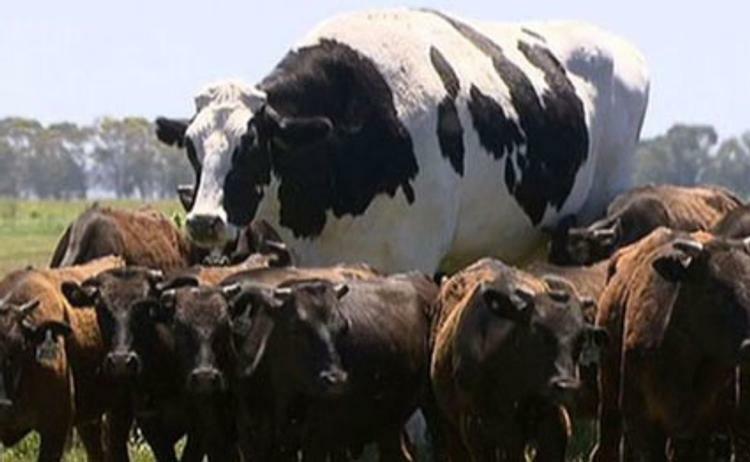 At some 1,400kg and 194cm, the seven-year-old is believed to be the biggest steer in a country home to millions of cattle. He will now live out the rest of his life on Lake Preston feedlot in Myalup, 136km south of Perth. Mr Pearson – who owns about 20,000 cattle – reckons Knickers has a few years left. He’s a hit with the other cattle, who follow him around the paddocks in their hundreds. Many of the cattle are wagyu and are dark brown. Black and white Knickers stands out even more in a pack because of his colour.